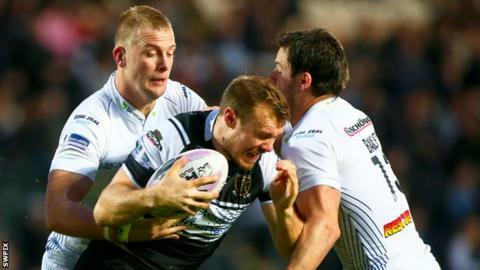 Hull FC climbed up to fifth in Super League as they ran in six tries against Huddersfield Giants. A pair of Giants errors let Fetuli Talanoa and Richard Whiting in for early scores, before Jordan Rankin and Danny Houghton added two more. Jodie Broughton pulled a try back for the visitors before the break. But Jacob Miller and Dean Hadley crossed in the second half as Hull FC registered their first back-to-back league wins of the season. The result also saw them pull two points clear of the eighth-placed Giants, who have now lost their last three Super League games. Huddersfield were without influential forward Brett Ferres, who is serving a five-match ban, and the England second-row's experience was sorely missed as the visitors gifted two early tries to the Black and Whites. First, Scott Grix's fumble allowed Hull FC to sweep the ball from right to left and put Talanoa over. Then Joe Wardle's decision to scoop a loose pass into play from the touchline enabled Whiting, who missed his first two conversions, to touch down. Huddersfield once again contributed to their own downfall. They conceded a penalty deep in their own half, which the home side quickly played to Rankin, who was adjudged to have gone over the line in one movement after a long referral to the television replay. Whiting put over his first goal of the night and the early rout continued with Houghton finishing a scintillating move that he started from his own territory, before Whiting collected the extras. Giants finally responded and it was Danny Brough providing the spark with a smart, looping pass out to Broughton for the try, which Brough converted. Last season's league leaders seemed more spirited after the break, but their momentum was cut short as Rankin chipped a delicate kick into the danger area and Miller rose the highest to claim and touch down, before Whiting added his third goal. And the contest was as good as over as Hadley beat Grix to a Kirk Yeaman grubber kick for his first Hull FC try. There was still time for Brough and Whiting to go into the sin bin for a needless scuffle as the game became a niggly affair before the buzzer.